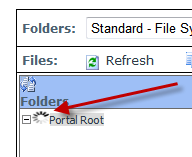 The treeview of the folder control seems to be in a endless loop and the treeview does not open the folder structure. In some cases, an error message displayed, other wise there was no error message. "Runtime error in Microsoft JScript: Sys.ArgumentException: Cannot deserialize empty string. Parameter name: data"
The problem seemed to be in any case the same. So If you are experiencing this problem check the Compression Setting which you can find in the "Performance Settings" section under the host setting. If the GZip Compression is selected, you must change the setting to "no compression"
As far as I know, the problem is already exists for a long time in the various different versions of DotNetNuke. So if you have this problem in an older version, check the setting and look what happens.